I’ve never seen a Seattle tourist guidebook, so I can’t accurately claim to know the most popular destinations. But as a former denizen of the area, I can tell you which places I’ve always taken out-of-town friends when they visit: the Pike Place Market and the Space Needle. The Space Needle is an obvious choice: an emblem of the city as well as a pretty sweet watchtower. There’s a rotating restaurant at the top and a huge science center at the base. They shoot fireworks off the top of it on the 4th of July and at the New Year. How much cooler can you get? It adds a lot of character to the city skyline, too. 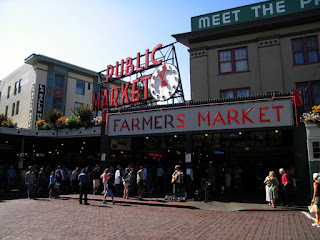 The next best place, though (and the feature of today’s blog), is the Pike Place Market. A little Seattle city history will set up the context. You see, back in the olden days (alright, not THAT long ago, but early in the history of the American Pacific Northwest), Seattle was a lumber town. Wood made its way from all over Western Washington State to the port of Seattle. And Seattle was a city built on a couple of hills and a landfill. You read that right. Basically, it was super hilly, and to get some flat land to make the harbor accessible, they filled in the bay with the leftovers. Of things. I can’t give you particulars, but I like to think that it was mostly woodchips. Anyway, at the bottom of the hill below downtown Seattle, right in front of the wharfs on Elliot Bay, someone put up a warehouse. From the bayside, it has 4 stories. From the street side (Pike Street, in case you were wondering) it looks like it’s only one story tall. That will give you an idea of the grade that the city is on. Like, if you made me drive a manual car up those hills, I would die of fright. No, seriously. The hills are suicidal. I mean it. The Pike Place Market opened in said building in 1907, and is one of the oldest continuously operating farmer’s markets in the US. The top floor, the one on Pike, is full of stalls which sell fresh fish, fruit, veggies, meat, flowers and other Farmer’s Market type things. The floors below house eclectic shops selling things like marijuana paraphernalia, comics, used books, crystals, and of course the necessary Seattle tourist merchandise. Across the street there are tiny restaurants, the original Starbucks store, and other curiosities. The whole area is very eclectic, and you will find street buskers and entertainers on every corner. So the atmosphere is often celebratory and the market full of tourists, city residents, music, clowns, street statues, homeless, and flying fish. Yes, you heard that last part right. There’s a fresh fish vendor smack in the center of the market that is famous for tossing the merchandise from person to person before they wrap it in newspaper and ice. A crowd always gathers, and when a purchase is made, the vendors yell to each other, a huge whole fish (or lobster) go flying over the heads of marketers, and the tourists get their photos. Here’s a typical tourists’ video. There are a couple of things about the market that I really love: Left Bank Books, an employee-owned and not-for-profit used bookstore, the fresh fruit stands (in season white peaches = so amazing it’s ridiculous), the huge bronze piggy bank (named Rachel, after a prize-winning, real live pig), and the original Starbucks store. Pike Place Market is noisy, colorful, a little chaotic, and a great taste of how the Seattle spirit works: mostly in the rain, and always with enthusiasm. Cool. Wow. Makes me want to run up to the Market right now! (Not really.) I hate the traffic into the city and the LACK of affordable (SAFE) parking. Great description, though. I remember the smells of fresh and cooked crab, fresh salmon, and other pungent deliciosities filling the nostrils 'till you want to explode! Also, there's an elevator for those of us who don't care to do the stairway routine. LOL! you're too funny... i love your tone in this post--"yes, you heard that right." sweet onion + watermelon = salsa? what lengths would you go to to get ___________.